Starting and growing a business in the Treasure Valley is easier than you might think and comes with a lot of perks. However, there are a few things to be aware of and a few resources you should know about to set yourself up for success, so keep reading! Boise has been named a top spot to build a business and innovate under the radar when it comes to tech. Historically, Boise’s economy was driven primarily by mining and agriculture, but over the past twenty years, according to Fast Company, Boise has solidified itself as a particularly affordable and attractive launchpad for tech careers, appealing to major industry employers like Hewlett Packard and Microsoft along with a quickly expanding startup ecosystem. Boise is home to more than 18,000 businesses, numerous Fortune 500 companies and dozens of corporate headquarters. Add in a reputation for affordable living, family friendly activities, and low crime rates, and it’s easy to see why so many people love to call Boise home when it comes to choosing a place to build a business. 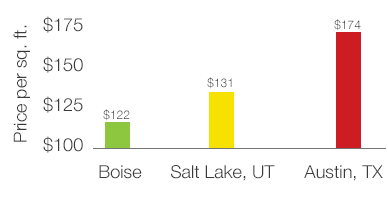 That said, with a little extra legwork, funding is still highly achievable in Boise. Startup Grind is the largest independent startup community that helps entrepreneurs find mentorship, connect to partners and potential hires, pursue funding, and reach new users. The local chapter provides regular “fireside chats” with notable speakers and networking opportunities based on their core values: making friends, not contacts; giving, not taking; and helping others before helping yourself. SBDC provides guidance in developing and growing a successful business as well as finding grants. SBDC can help if you’re trying to start a business in Idaho and need help, have an idea for a new product or innovation and need help getting started with development and marketing, or have questions about environmental impact or Idaho laws. Wayne Brown Institute is a non-profit accelerator that specializes in helping entrepreneurs prepare for equity capital investments. Businesses submit an application to the Venture Funding Program to determine readiness for funding, receive feedback on questions investors may have, and are assisted in honing their pitch to attract investors; to ultimately get funded and successfully commercialize. Increasing available funding from government and private investors. Developing and protecting intellectual property. regular events, including peer-to-peer forums, CEO roundtables, and opportunities to meet with civic leaders and nationally-recognized analysts. The CORE is determined to build a healthy MedTech ecosystem in Idaho through innovation in health, research and MedTech. Their mission includes support and development of businesses from startups to hospital systems and companion animal innovations. Boise Angel Alliance investors have successfully raised millions of dollars for local startup companies in the Treasure Valley. They invest in early-stage, high-growth-potential companies and do their best to help portfolio companies be successful by sharing their networks and providing access to experience. Keiretsu Forum Northwest Region chapter (angel funding) formed in 2005 and is comprised of the Boise, Kirkland-Eastside, Portland, Seattle, Spokane-Inland, and Vancouver chapters. A great source for regional angel funding, the Forum has diverse industry expertise extending from software, telecommunications and life sciences to retail and information technology. Need help turning your ideas into a business? The New Ventures Lab, a shared working space in Meridian (a suburb fifteen minutes from the heart of downtown Boise) connects ideas, people and resources. An entrepreneurial Petri dish for your business ideas. A shared working space and incubator in downtown Boise. Trailhead was founded on the simple premise of making it easier for every kind of entrepreneur to get their business started. Created by entrepreneurs for entrepreneurs, Trailhead is the place to find resources, explore new technologies, and create something all your own. From a casual, yet connected coworking space to high-octane workshops, they’re dedicated to giving entrepreneurs access to the tools and connections they need to build something with impact. high ranking location for business and careers due to low housing prices and the low cost to leasing or buying commercial real estate. So, just how affordable is commercial real estate in the Boise market? Colliers International 3rd Quarter 2015 report, the Treasure Valley Office Market continues to show steady growth, with both asking rates and vacancy rates moving in a positive direction. Ada County has a historically high vacancy rate of 13.05% (despite a positive absorption rate) yet based on supply and demand for office space the market is considered to be in the early stages of expansion. LoopNet, these are the commercial real estate trends finishing 3rd quarter 2015. According to the Colliers report, office space rental rates are expected to continue to climb, but not excessively, since the downtown Boise area is expected to have more vacancies in high quality buildings (due to new build-to-suit office space becoming available), effectively keeping rental rates in check. Colliers also expects businesses to continue entering the market and leasing to remain steady in 2016. Mark Bottles Real Estate have handled TSheets’ real estate needs over the years. Trusted friends to the TSheets crew, carrying an exceptional reputation in Treasure Valley and southern Idaho real estate, Mark and his team can help you find the best location for your business. Give his team a call at: (208) 377-5700. Thornton Oliver Keller provides real estate brokerage and property management services to property owners and businesses throughout Idaho. They can be reached at: (208) 378-4600. Colliers International is ready to provide market data and commercial real estate services to help you find the right location for your business. They can be contacted at: (208) 345-9000. 800,000 in Idaho’s labor force. tips on hiring and recruiting (without hiring headhunters) in Boise on American Express Open Forum. In 2012, the state of Idaho approved an initiative known as the Idaho Global Entrepreneurship Mission (IGEM) providing $5 million to fund grants and research at Idaho schools. The objective of IGEM is to combine the expertise from Idaho’s research universities and Idaho’s private industry to create new ideas, products and companies to lead to higher paying jobs and an even stronger economic foundation for Idaho. Boise State University, Venture College — This non-credit program provides student coaching, weekly colloquiums and opportunities for internships and funding, to help students start businesses or nonprofits while pursuing their education. The Center for Entrepreneurship at Boise State University — Hosts speaker series and pitch competitions, and runs The Kitchen Venture Lab (a free collaborative idea generation space for University students, and rentable space for business and nonprofits locally). Bureau of Labor Statistics, Boise’s average hourly wage (across all industries) of $19.98 is below the national hourly average wage of $22.71. As an employer, your cost per employee is lower in the mountain region than the national average, coming out at $27.87 including wages and benefits per employee, compared to the national average of $31.39 per employee, per hour. With a lower wage and cost per employee also comes a lower cost of living. housing 1% less than national averages. 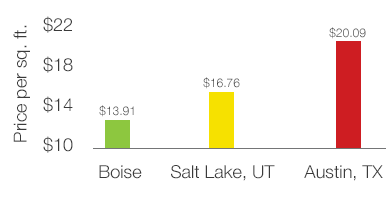 Additionally, Idaho’s overall tax burden and per capita debt are among the lowest in the West. While it’s true that funding may be more difficult to come by off the beaten path in Boise, the low cost of real estate, lower employee costs, and low cost of living make Boise one of the most attractive places to build a business.